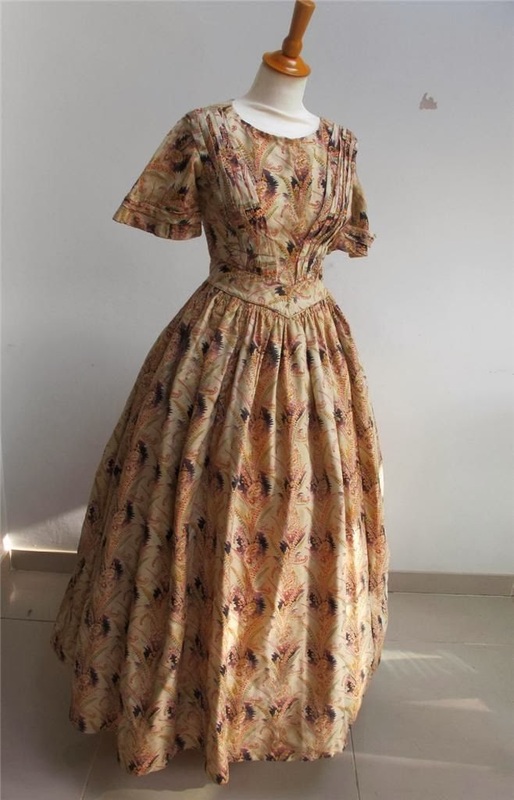 I'm very happy to announce that I have finished my first pattern for sale. 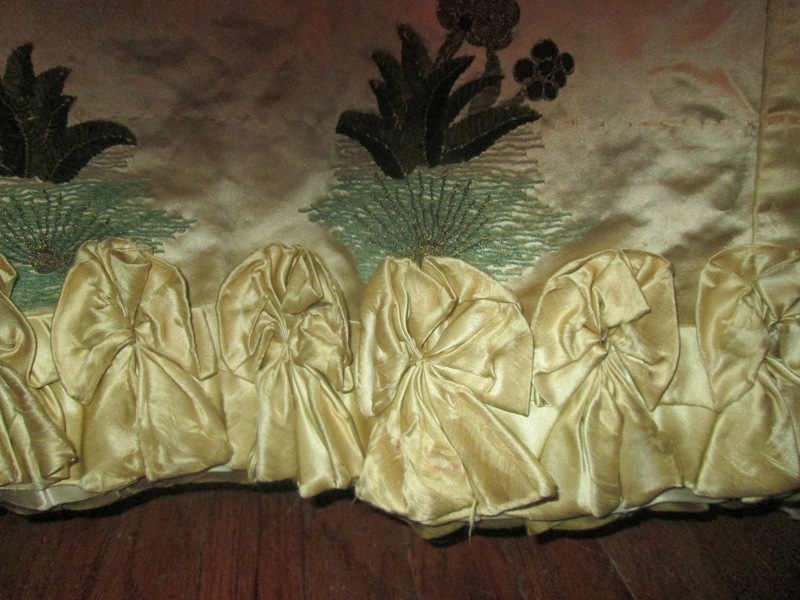 It's of a pair of 1790's stays I have in my private collection. 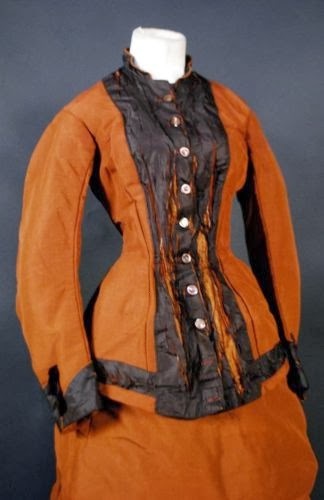 This is to the original measurements and would fit a smaller sizes (a small busted 2 to a large busted 6 due to the squish factor and the lacing in both front and back). 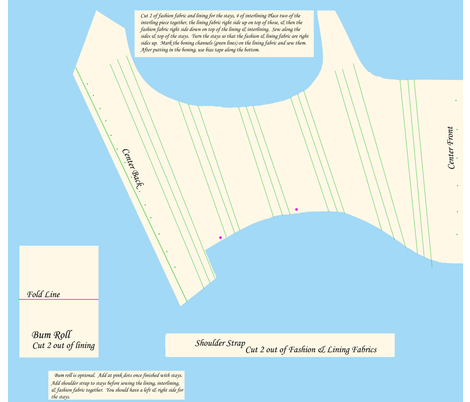 the pattern is based off the blue stays that you can see at the bottom of the link. 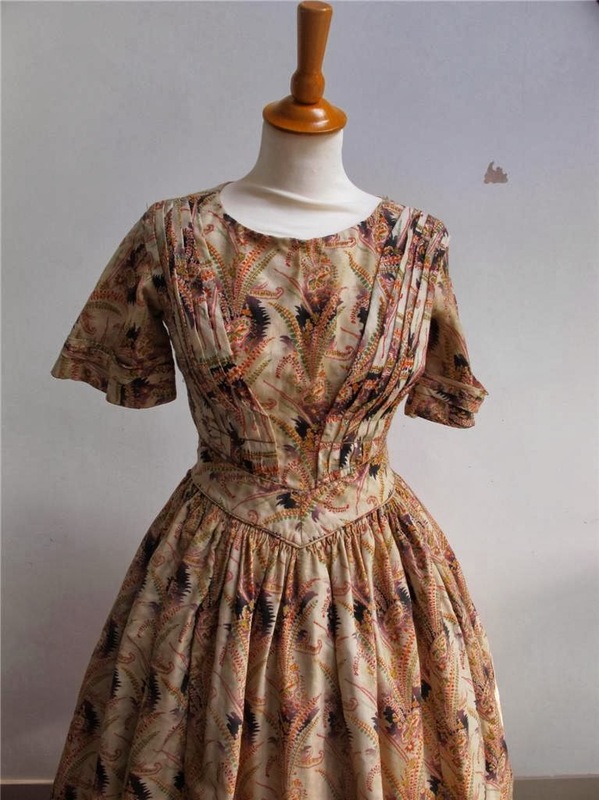 The pattern is currently only for a size small but I do plan on adding a medium and large in the near future. 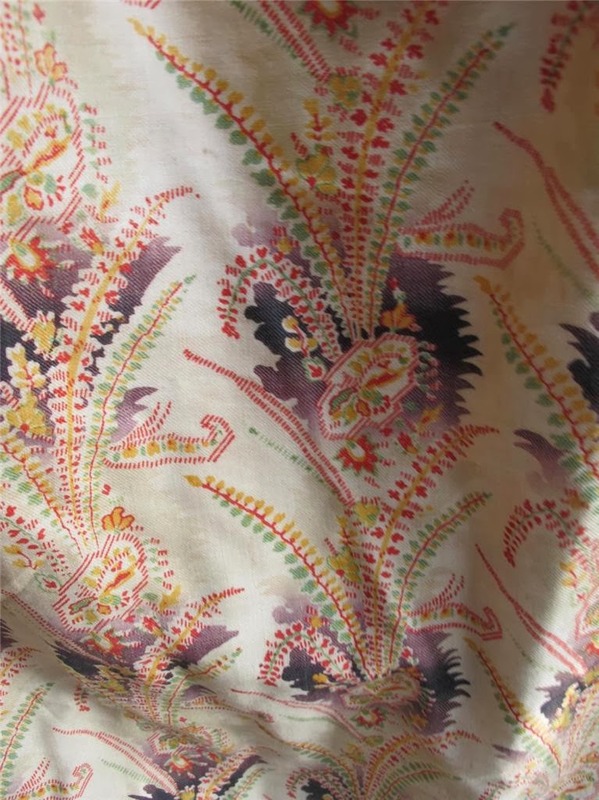 You can buy the fat quarter at spoonflower. 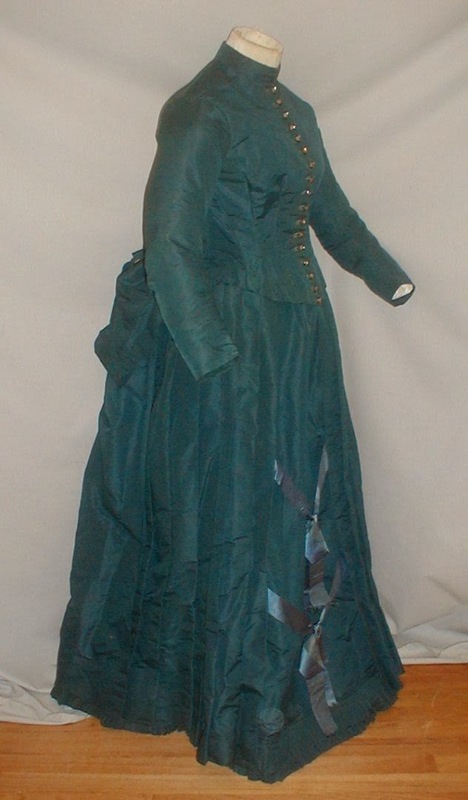 I don't think I have a picture of the blue pair, but I wear them with pretty much every single Regency gown I've made. 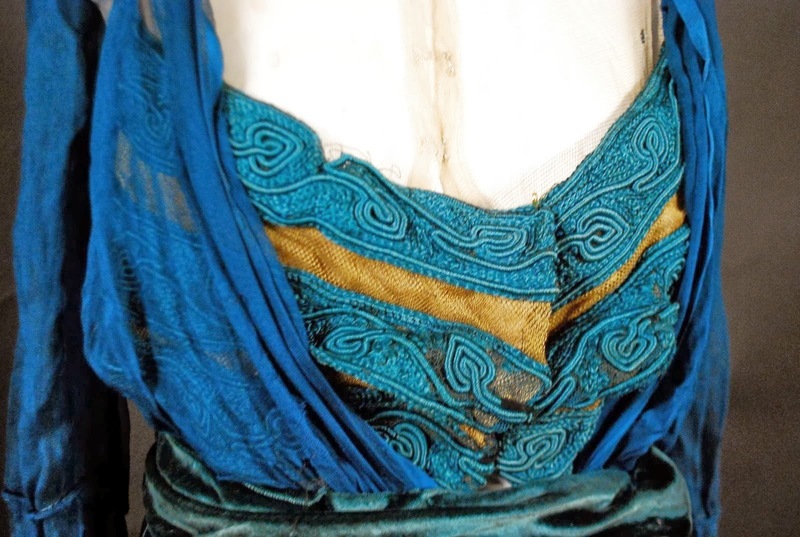 The blue pair are a bit hardier because of the fabric I used. 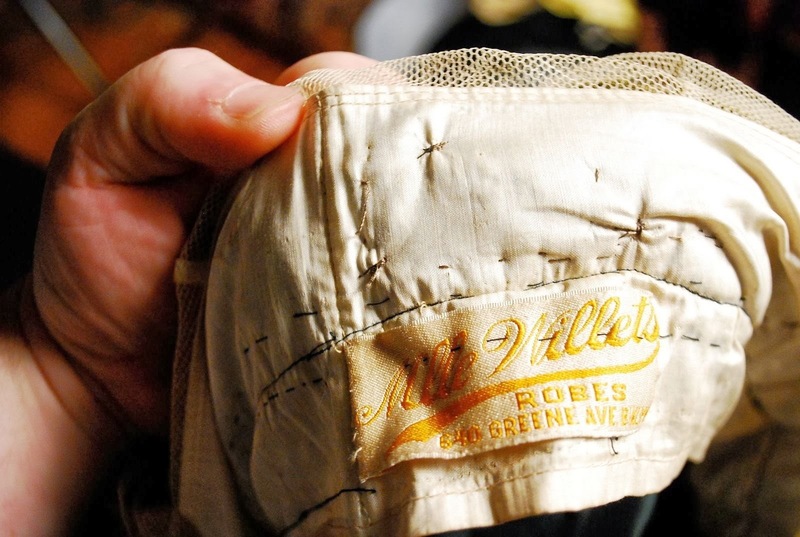 If you have any questions, feel free to ask. 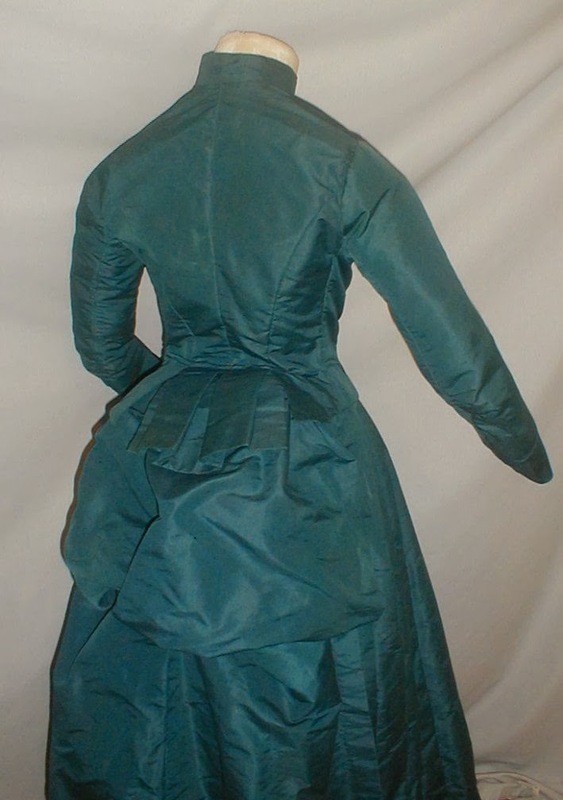 WAIST TO HEM FRONT --39.5"
WAIST TO END OF TRAIN IN BACK--70"
This is probably right around that 1879/1880 cusp. 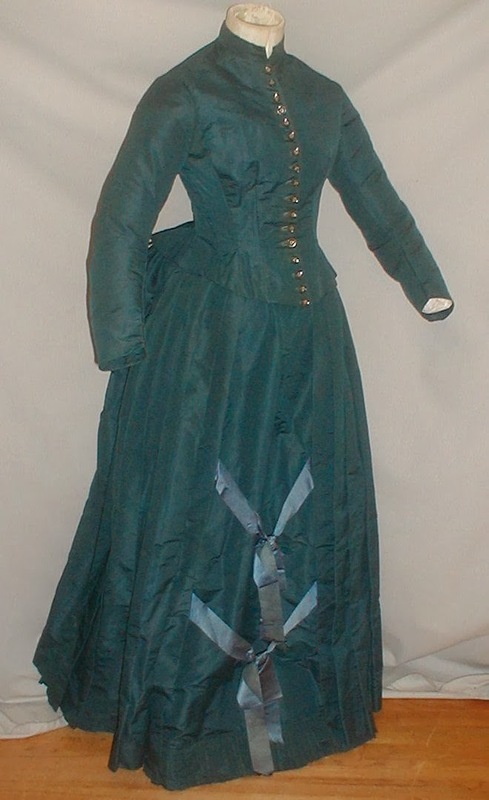 And I have named this dress "Lillipad". 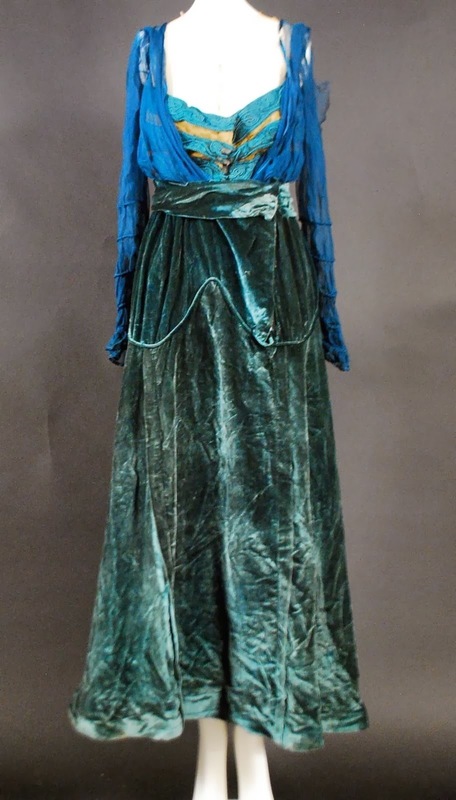 I hope that Lilly found her frog prince! 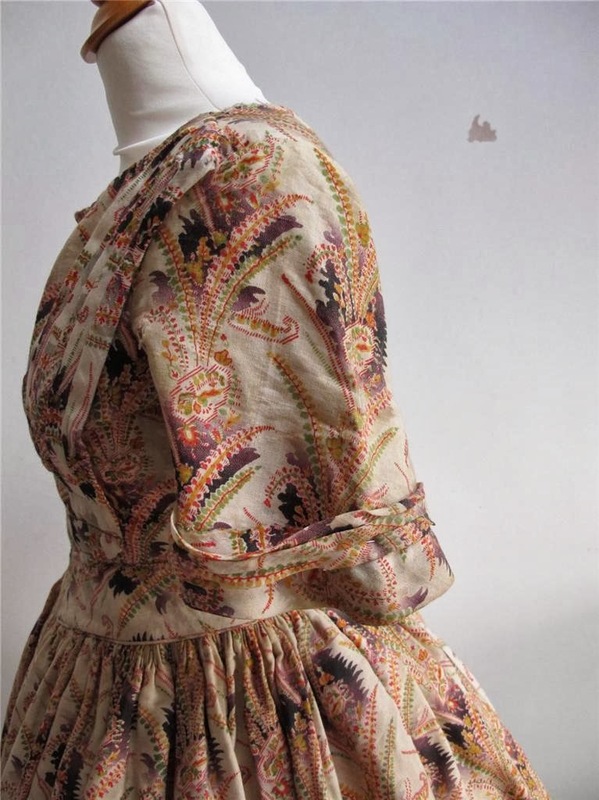 Wonderful antique early Victorian day dress, which has been produced from cream wool fabric, with delicate red, yellow and green floral roller printed pattern. 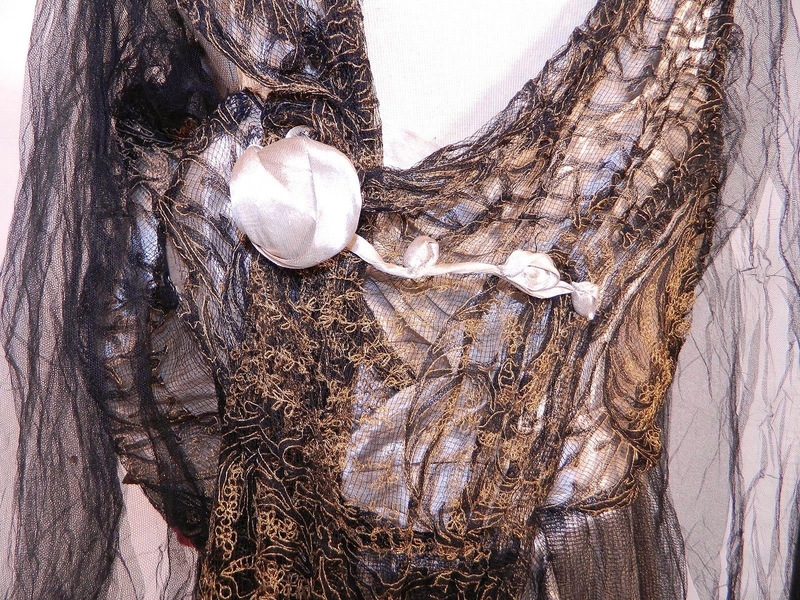 The gown has pleated "v" detail to the front of the bodice, ending with a "v" to the waistline. 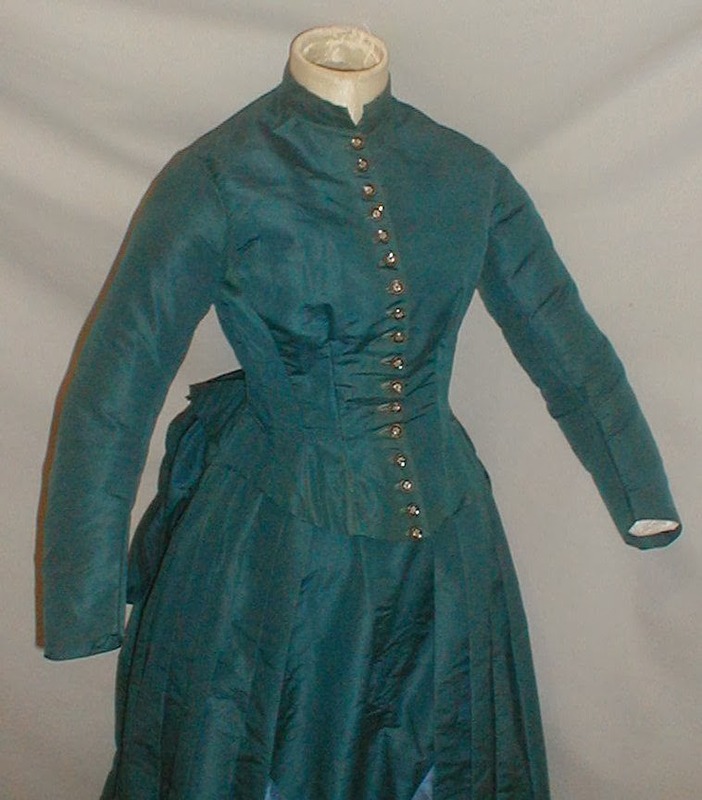 The gown has short pagoda sleeves, and I suspect that it may have had detachable lower sleeves, although these are missing. 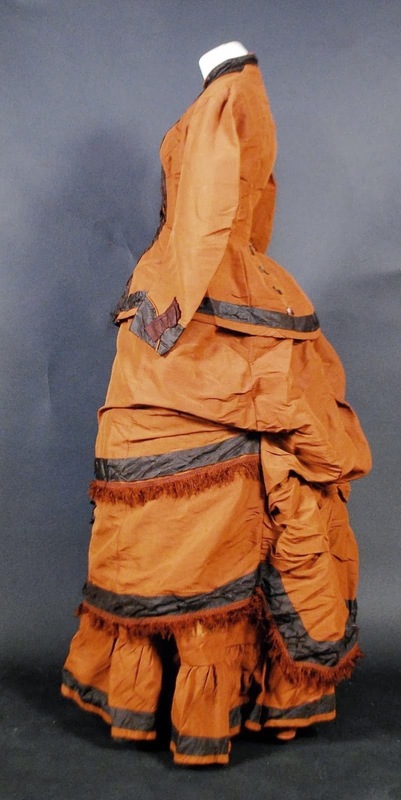 The gown has a split to the seam to allow access to a pocket in the underskirt or petticoat, and fastens to the back via a series of blacked steel hooks and eyes. 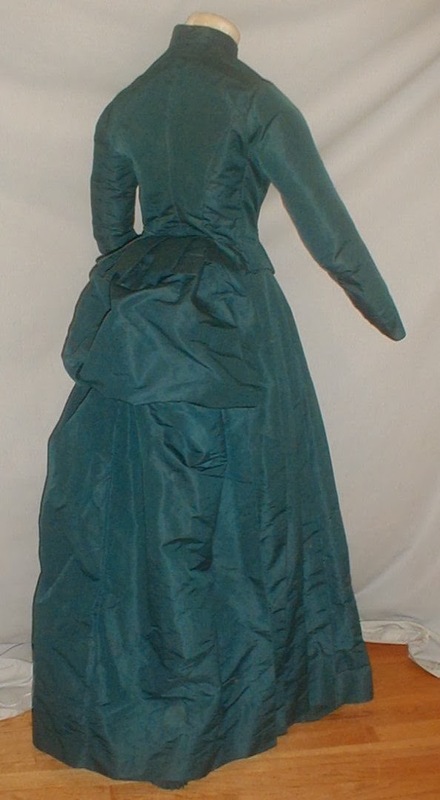 This is very mid 1850's in style. 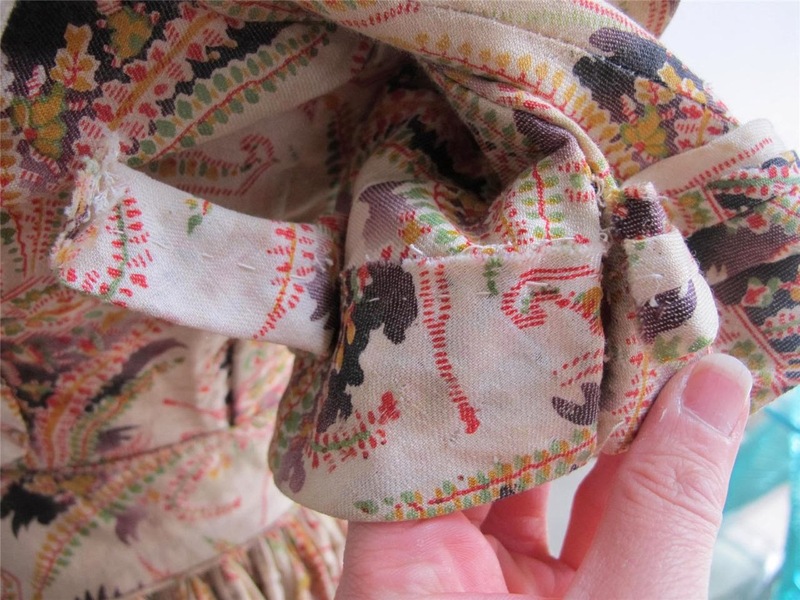 I love all the detail shots of this dress - thank you, Seller!- and how colorful the fabric is. 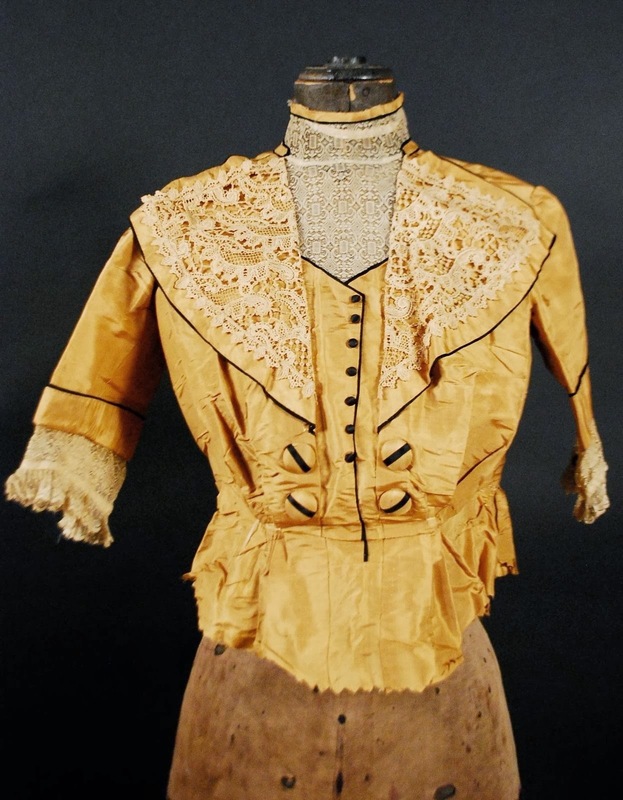 This would have been worn with false undersleeves. 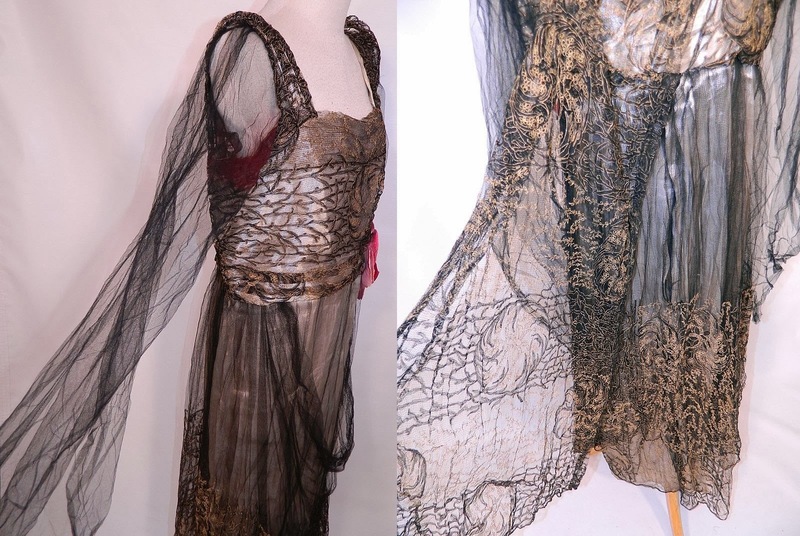 This exquisite Edwardian Titanic era silver lamé black and gold metallic net lace evening gown dates from 1912. 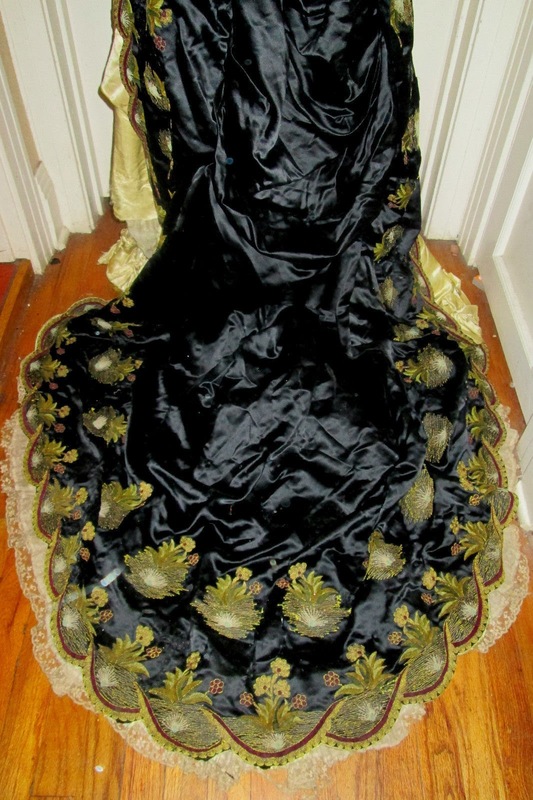 It is made of a silver metallic lamé silk fabric lining, with a sheer black tulle net and gold metallic embroidered lace overlay done in a circular swirling medallion, branch leaf design pattern. 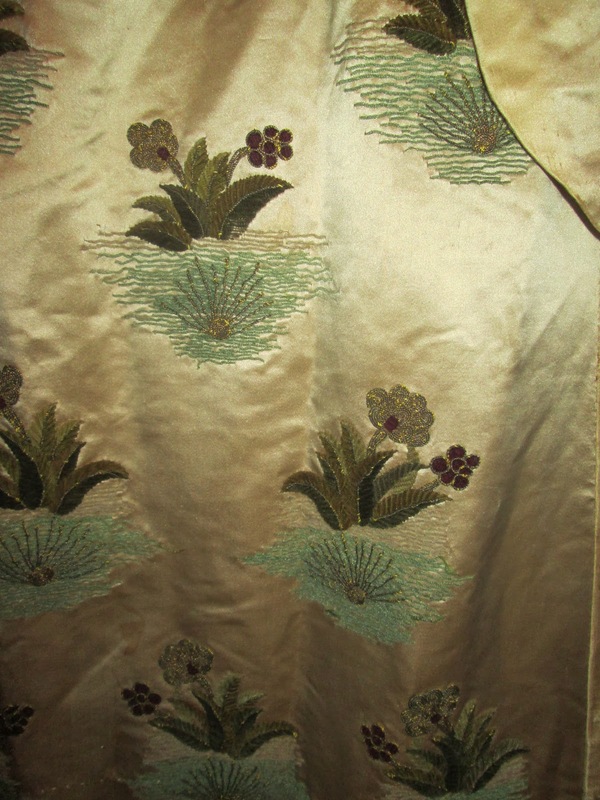 This gorgeous evening gown dress is a long floor length, with a layered drape asymmetrical uneven style, long exaggerated flared net kimono style sleeves, a large fuchsia pink velvet flower trim at the waist, silver lamé rosette rosebud flower trim on the back, fully lined in silk and snap, hook closures down the back. 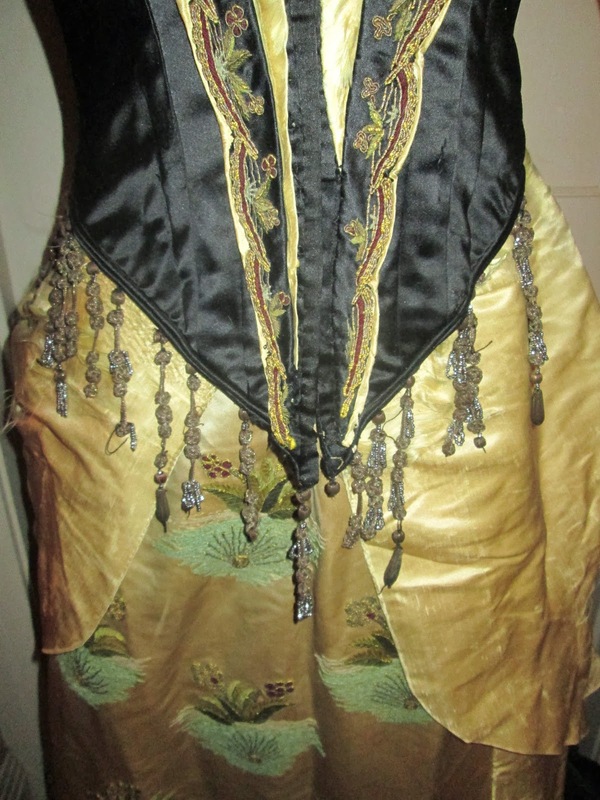 The dress measures 60 inches long, with 38 inch hips, a 28 inch waist and 38 inch bust. 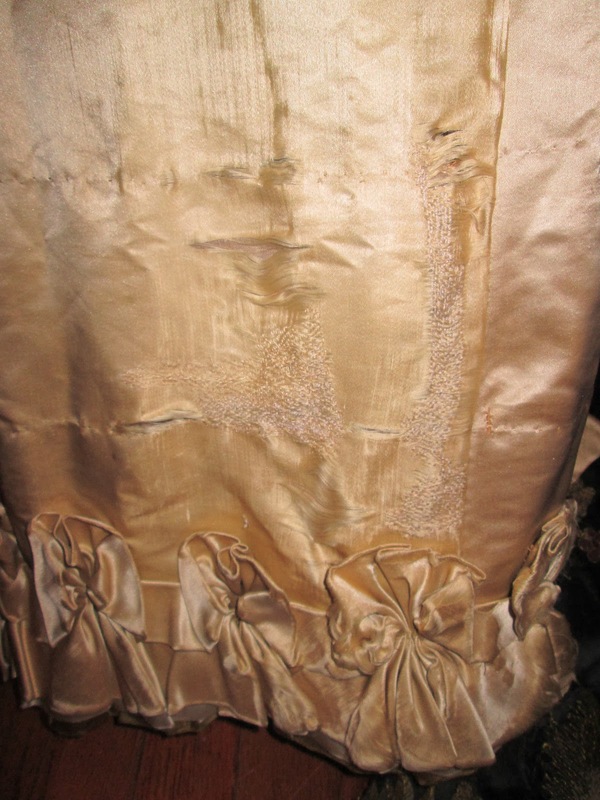 It is in good condition, with some faint tarnish discoloration on the silver lamé lining front skirt and discoloration staining under the arm. 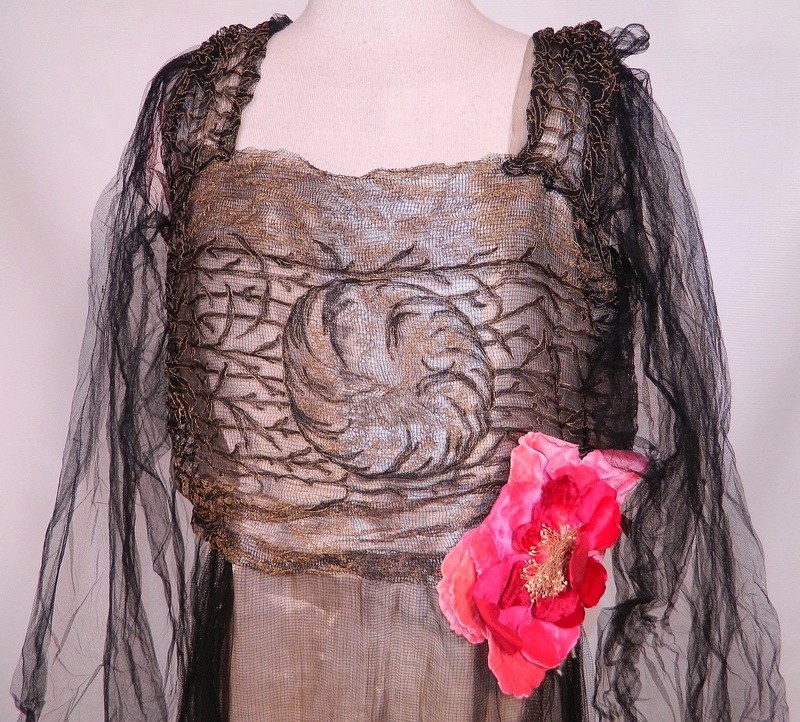 This is truly a rare and exceptional quality made piece of wearable art! 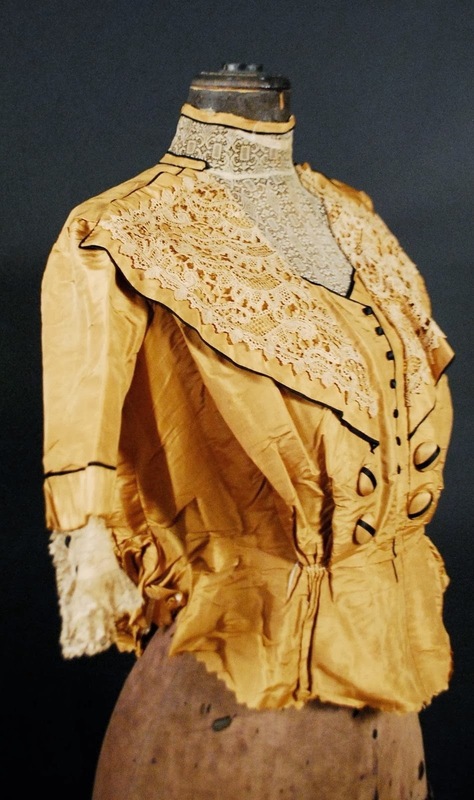 It looks later than 1912 to my eye. 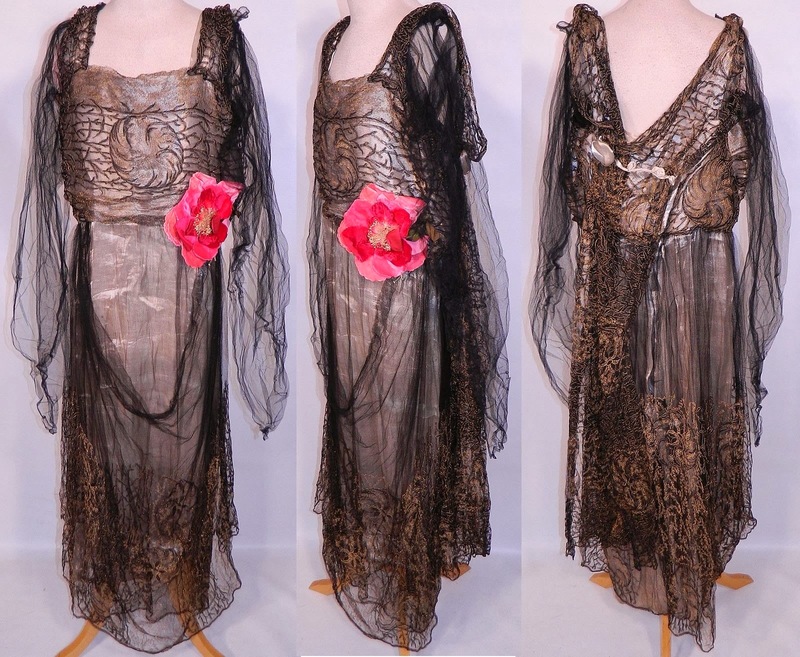 I'm thinking more 1918 here - particularly with those sleeves! 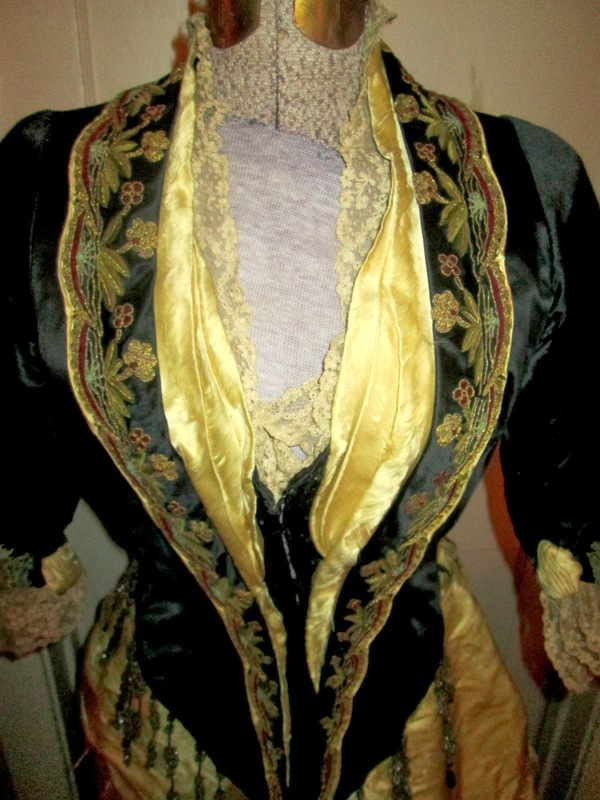 THIS DRESS DATES TO THE EDWARDIAN ERA AND IS SOLD AS FOUND, GREAT FOR ITS PARTS OR FOR RESTORATION. 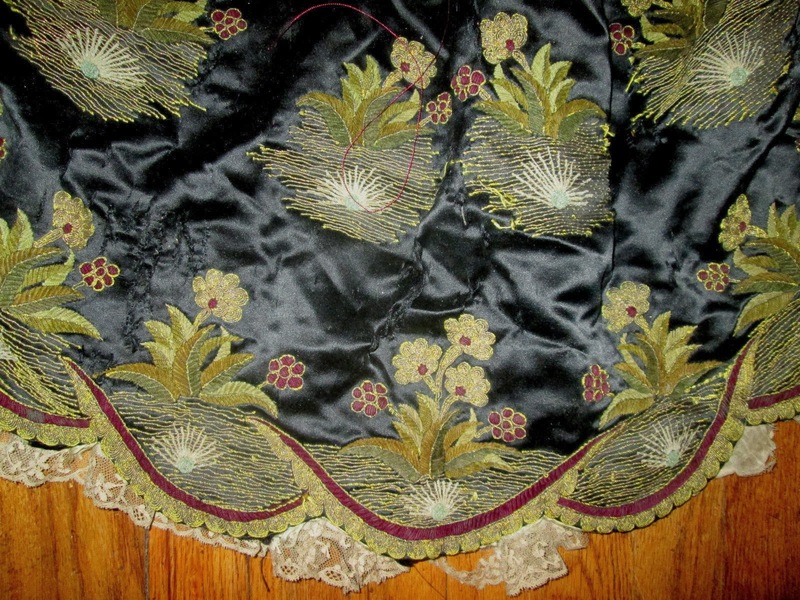 THE SKIRTING IS FASHIONED OF A GREEN SILK VELVET WITH A DENSE WAVING PIPE RUNNING COMPLETELY AROUND THE FRONT AND REAR, MATCHING VELVET BELT ENCIRCLES THE WAIST WITH ITS BODICE IN A NET BASE THAT IS TRIMMED IN BANDS OF DENSE EMBROIDERED SOUTACHE ON NET. 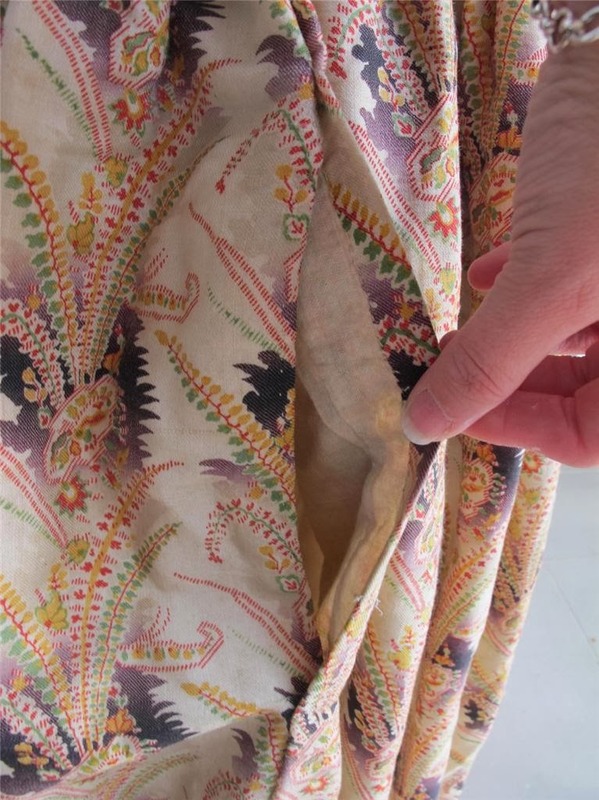 THE OVER BLOUSE IS IN SILK CHIFFON BUT THERE IS HEAVY BREAKAGE UNDER THE ARMS AND THROUGH THE SLEEVES AND IS IN NEED OF COMPLETELY REMOVAL. 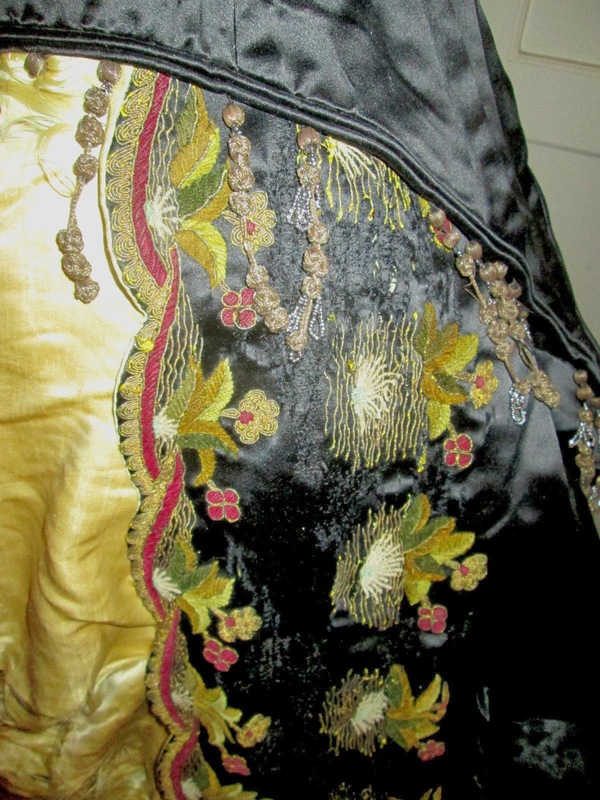 DEFINITELY WELL WORTH RESTORING AS THE FULL BASE GARMENT IS THERE AND IS OTHERWISE IN STRONG CONDITION. 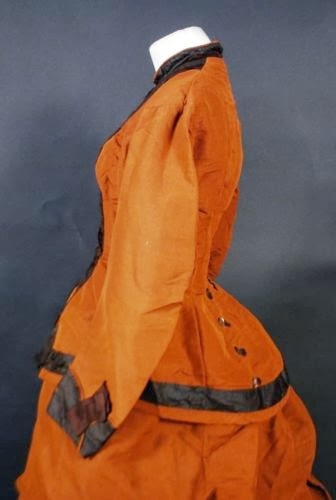 Early to mid Teens era. Probably about 1876 on this one. 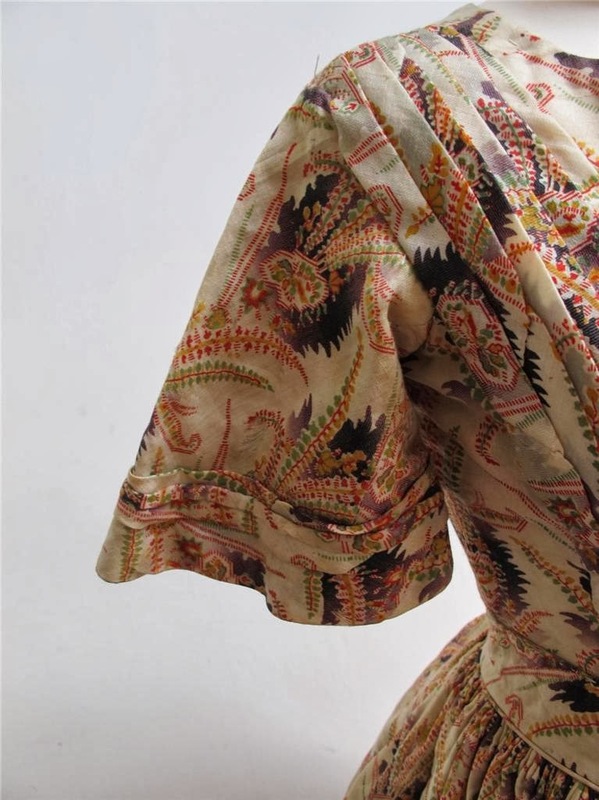 Those sleeves are very 1870's. 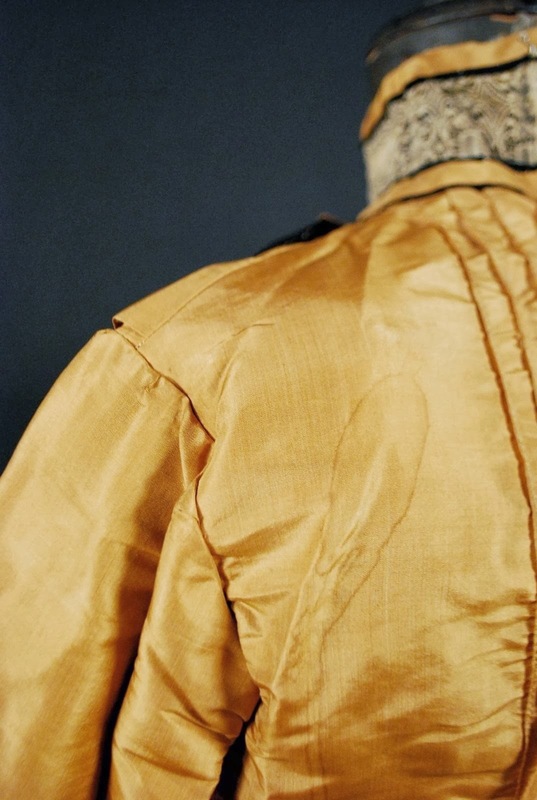 THIS SHIRT WAIST DATES TO THE EDWARDIAN ERA AND IS FASHIONED OF SILK TAFFETA, CLOSING WITH HOOKS IN THE REAR. 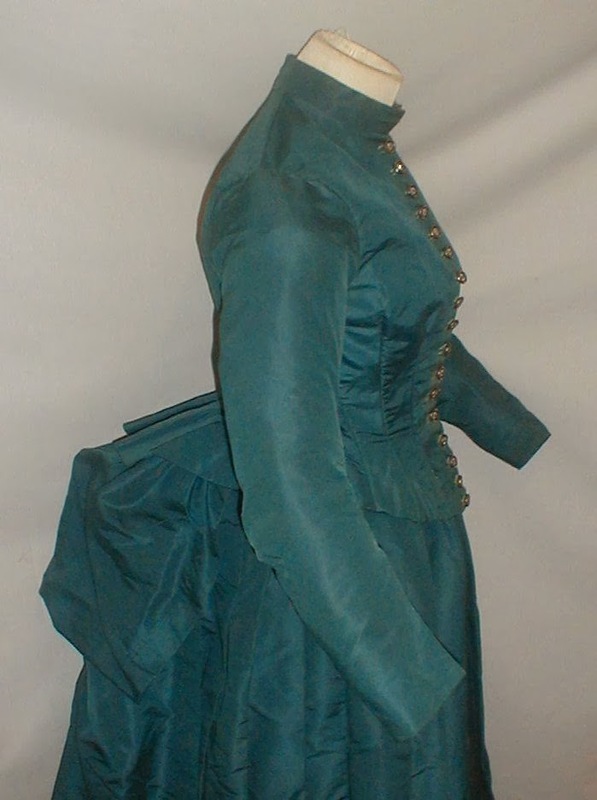 A majestic 1880’s deep teal blue bustle dress. 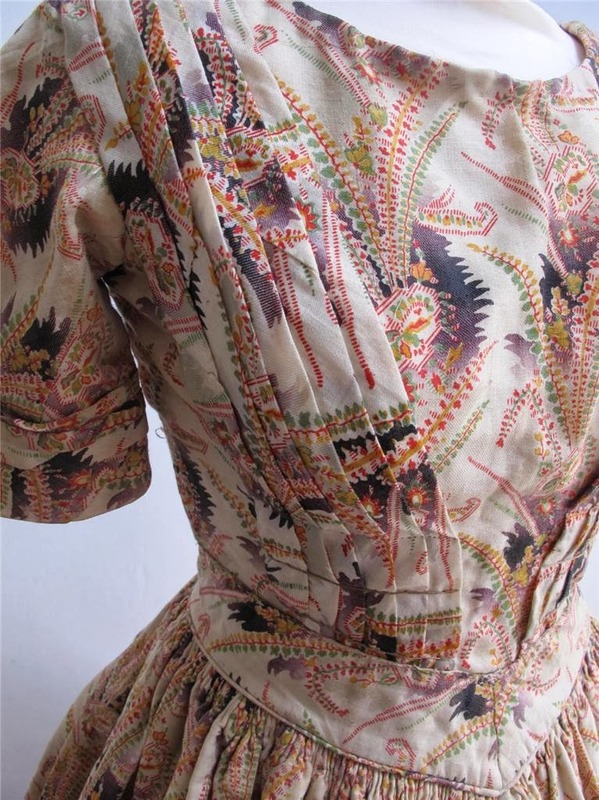 The bodice has a high neck and front button closure. 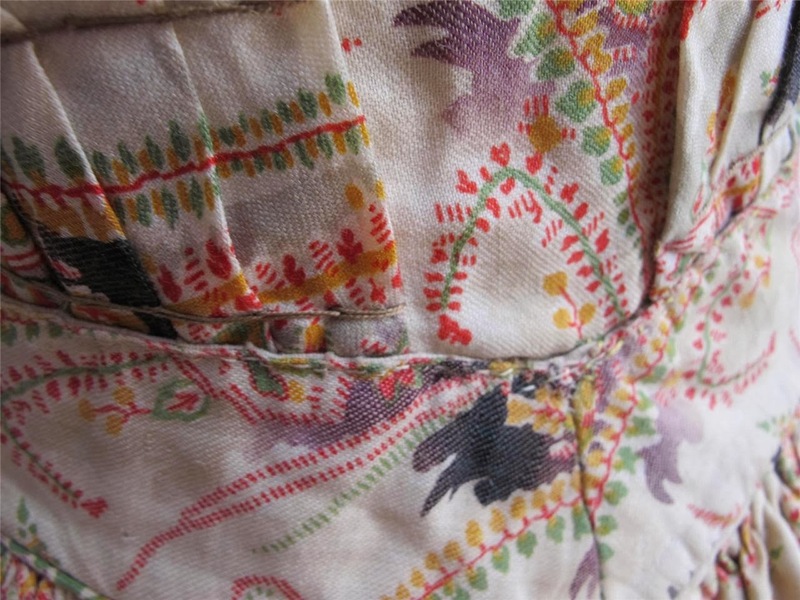 It is lined with cotton. 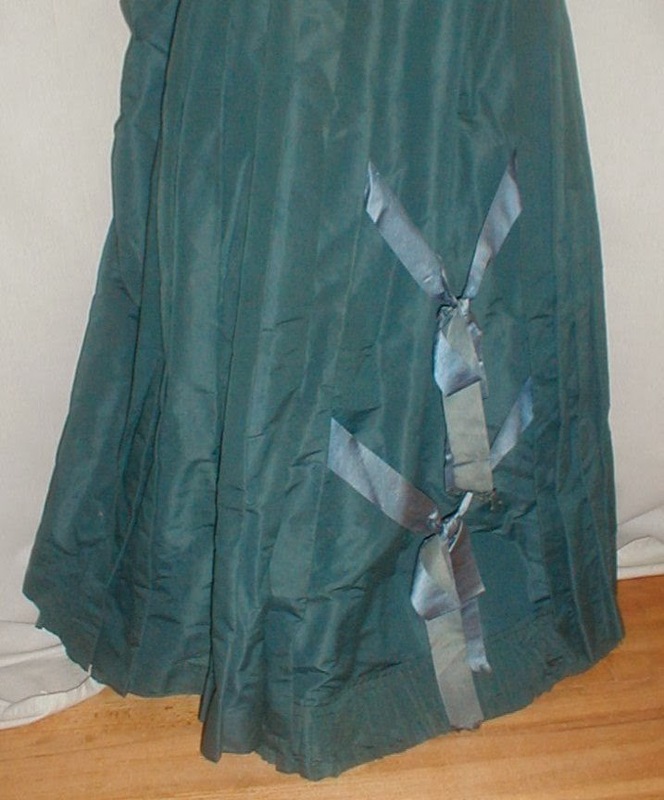 The skirt has a pleated front and the center panel is decorated with blue satin ribbon bows. 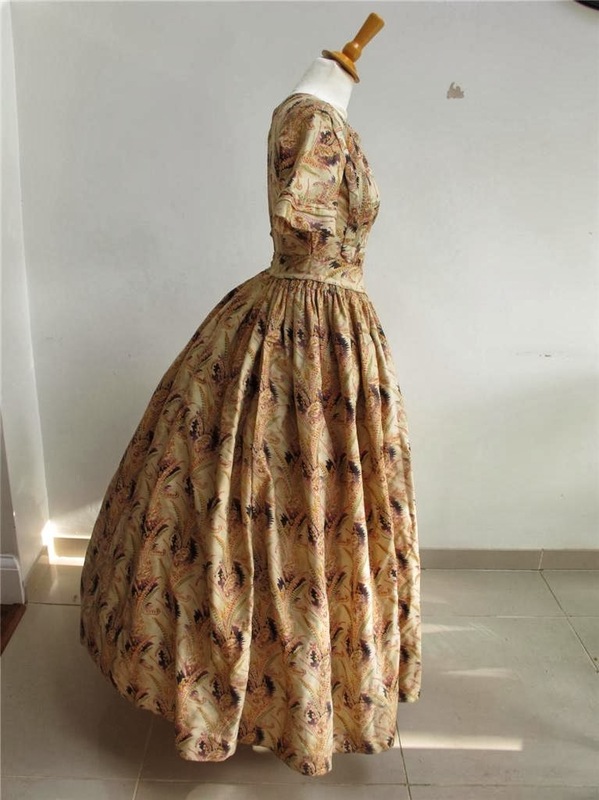 The back of the skirt has a draped panel that is gathered into a bustle effect. 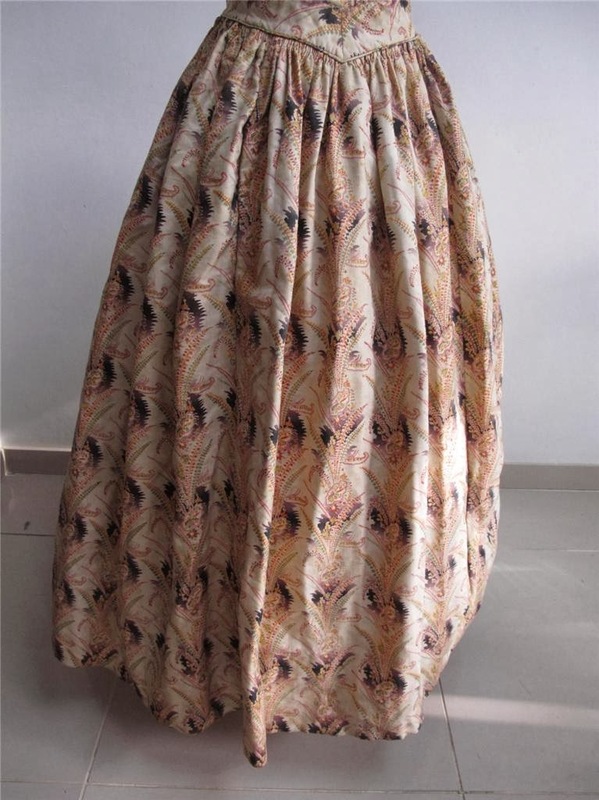 The skirt is lined with cotton and has ties on the inside for adjusting the bustle effect. 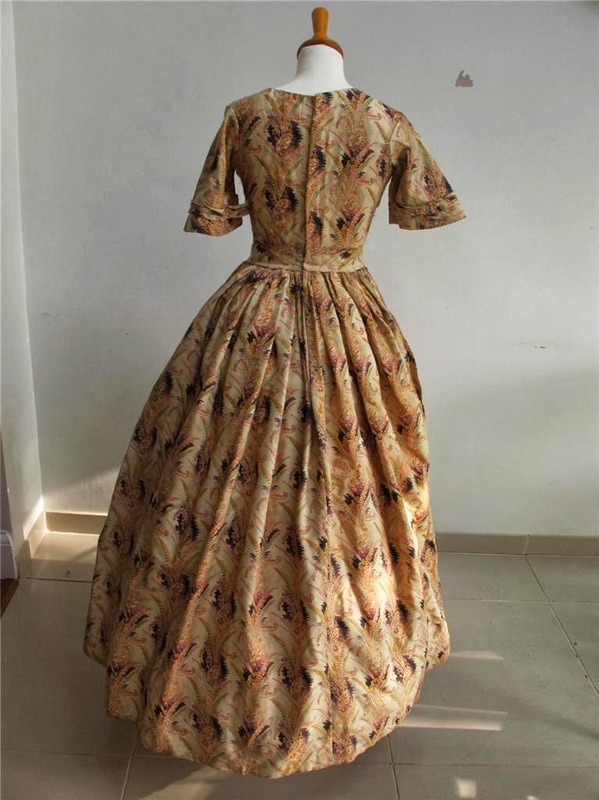 The dress is in very good and sturdy condition. 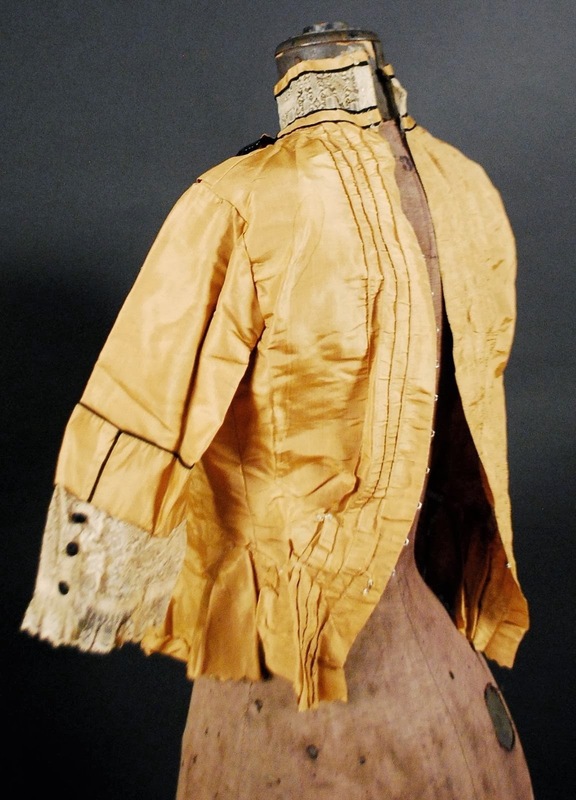 There is slight underarm discoloration, a 1 inch stress break under one arm and a few minor pencil tip size holes on the bodice and one small pea size hole on the skirt. 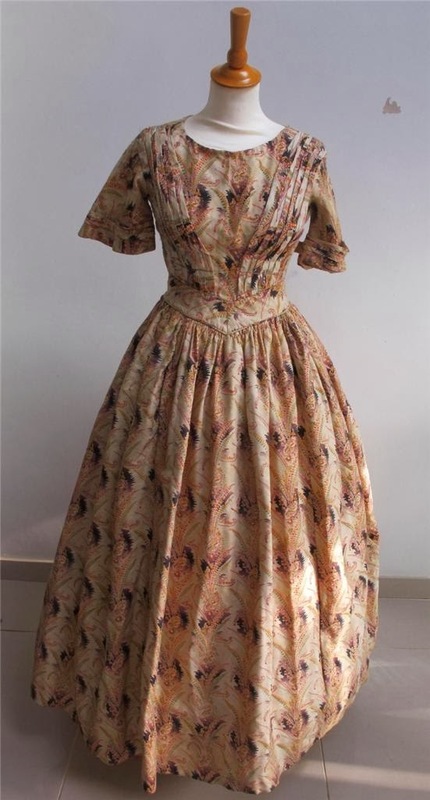 A very attractive display dress Bust 32 Waist 24 Skirt length 40. 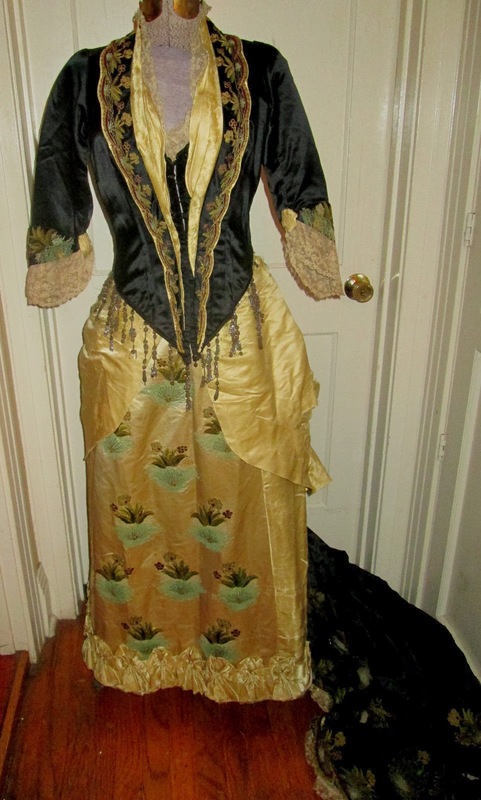 I'm pretty sure this is 1870's based on the waistline, bodice length, and sleeves. 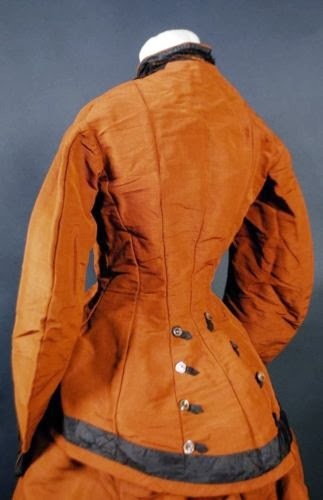 Also, it's rather simple (although lovely) which would make more sense in the 1870's.